For most of the summer and fall, I was pretty sure Scott Pilgrim had wrecked me for good. I had picked up and abandoned a ton of graphic novels. None of them had the right mix of whimsy and humor and kickassedness I was looking for. My friend Wolfdogg, who really got me into graphic novels, asked me month after month if I had finished the handful of books he’d loaned to me. I whined to him how I just couldn’t seem to get into anything, anything that wasn’t Scott Pilgrim. “GET OVER IT,” he shouted. Yes, he shouted. I’m not even exaggerating. I guess it’s the comicbooknerd version of tough love. Personally, I kind of wanted to yell at him for hooking me on the Y the Last Man series before Scott Pilgrim, because Y would have been the perfect. I needed something a little outside reality, engrossing, imaginative, and, well, long. Enter the Fables series by Bill Willingham. I am saved! Before you Scott Pilgrim addicts get all trigger happy, you should know that if Scott is HoHos then Fables is like some sort of molecular gastronomy experiment involving liquid nitrogen and the essence of HoHo. You know? 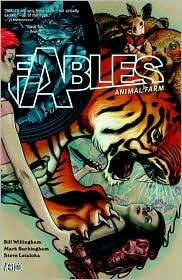 The series opens with Fables Vol. 1: Legends in Exile, which finds many of the heroines and heroes of fairy and folk tales living in an enchanted apartment building in New York. It seems the Fables have been chased out of their magic kingdoms, which they call The Homelands, by something called The Adversary. This first volume seems to be about getting the reader comfortable with the personalities we’ll be dealing with in the series. We’ve got Snow White as the deputy mayor of Fabletown, serving under Old King Cole. She oversees the daily operations of the community with Bigby Wolf (get it?) as her sheriff. Ol’ Bigby has atoned from his crimes against little piggies and the likes and has been allowed to take on human form. Volume 1 opens with a murder mystery. It seems Rose Red, Snow’s rebellious and estranged twin sister, has been murdered. The book follows Bigby and Snow as they try to solve the mystery and along the way introduces us to the citizens of Fabletown and the fortunes that befell some of those favorite characters. Things really get cooking in Fables Vol. 2: Animal Farm, when a few of the Fables venture up to the land in upstate New York where the non-human fables have been living. Here’s where you find the pigs and the giants and those kinds of beings. When Snow gets up the farm she’s forced to try and quell an uprising. Seems Goldilocks is stirring up trouble and trying to get the animals to invade The Homelands and fight The Adversary in hopes of regaining control of their homes. Things don’t got as planned for anyone. 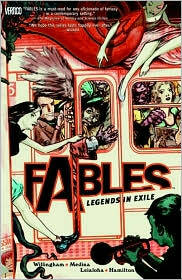 Finally, Fables Vol. 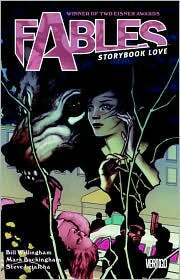 3: Storybook Love finds the Fables being blackmailed by a reporter who is sure he’s discovered their secret. . . they’re vampires. With the help of Jack (of Beanstalk fame), Prince Charming, Briar Rose, and Bluebeard, Bigby sets out to take care of the problem. Along the way we find out what some of the characters have been up to since we last heard from them in the fairy tales and how deep the Animal Farm rebellion has infiltrated Fabletown. So far, I’m totally digging the series. It’s clever and mysterious. Since it uses characters so many of us grew up with, reading it makes you feel a little bit like an insider. Plus, there’s a level of satisfaction, curiosity sated to find out what happened after happily ever after. I’ve already ordered volumes 4-6 and cannot wait to read them.